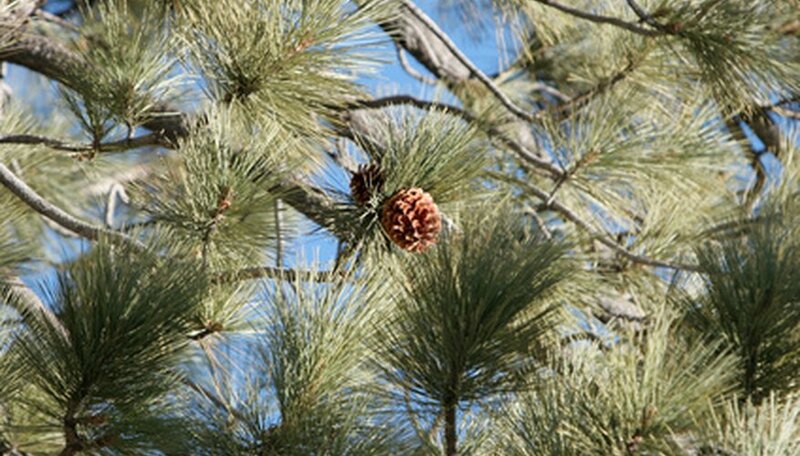 Pine trees are distinguishable from other trees with their evergreen needle foliage and pine cones. Missouri is home to several types of pine trees that are used to naturally solve landscaping problems and for lumber used in the manufacture of furniture and other products. The shortleaf pine tree flourishes in dry acidic soils with full sun exposure. According to the Missouri Department of Conservation, it is the only native pine tree in the state of Missouri. The department recommends planting this Missouri tree only in locations south of the Missouri river to ensure proper soil requirements. The Shortleaf pine is a fast-growing tree that reaches an average height of 90 feet and is favored for commercial cutting. The rapidly growing eastern white pine tree also reaches an average height of 90 feet. An interesting characteristic of this Missouri pine tree is that it grows a new row of branches at the top of the tree each year. This addition creates the tree’s cone-shape. According to the Missouri Department of Conservation, the eastern white pine tree in Missouri makes an excellent natural windbreak and soil erosion solution for landscaping. The tree does well in partial sunny locations with moist to wet sandy soil. The jack pine tree is smaller in size to other pine trees found in Missouri. The average spread of this pine tree is only half its average height of 60 feet. According to the Missouri Department of Conservation, the jack pine grows further north than any other pine. For this reason, the tree does well when planted north of the Missouri river. It will grow in a variety of soil conditions and requires moderate to full sun exposure. The red pine tree is distinguishable from other pine trees in Missouri by its reddish-brown bark and shape. The tree reaches an average height of 80 feet. Unlike the other pines of this state, the red pine tree has less branch density on the lower portion of the tree. The tree grows well in the same areas of Missouri as the jack pine tree. It is used for lumber, lumber pulp, erosion control and windbreaks.